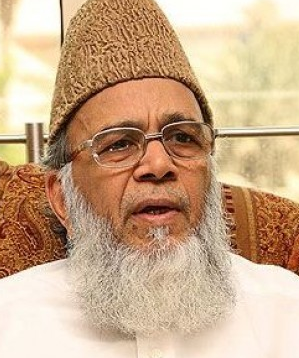 January 28, 2014 ISLAMABAD: People like the late al Qaeda leader Osama bin Laden do not die but stay alive in the hearts of people, stated Jamaat-e-Islami (JI) Ameer Syed Munawar Hasan while addressing a seminar in Islamabad, Express News reported on Tuesday. Hasan added that death of the al Qaeda leader was considered a big victory for 60% of the countries around the world, but the US is afraid that bin Laden will come back alive after the withdrawal of Nato troops from Afghanistan. Commenting on the pull-out of foreign troops, the JI chief remarked that Afghanistan has become the ‘graveyard of science and technology’ for the West. The US had planned to withdraw several thousand troops from war-torn Afghanistan last year and Nato has set 2014 as a deadline for a complete withdrawal. The US had a 150,000-strong Nato operation in the country and it also plans to withdraw all its combat troops by the end of this year. In May, 2011, bin Laden was shot dead deep inside Pakistan in a night-time helicopter raid by US covert forces, ending a decade-long manhunt for the mastermind of the September 11 attacks. World leaders had welcomed the news of bin Laden’s killing. In the United States, the Islamic Circle of North America (ICNA) is generally considered to represent the JEI. ICNA has a particularly close relationship with the Muslim American Society (MAS), a part of the U.S. Brotherhood, and the two organizations have been holding joint conferences in recent years. In addition, many past and present leaders of the Islamic Society of North America (ISNA), also part of the U.S. Brotherhood, have backgrounds that are strongly associated with JEI. One notable example is India-born Muzammil Siddiqi, a past ISNA president and leader of the Fiqh Council of North America. Our predecessor publication discussed a 2008 invitation by ISNA to another JEI leader.